I made it to my ultimate destination! 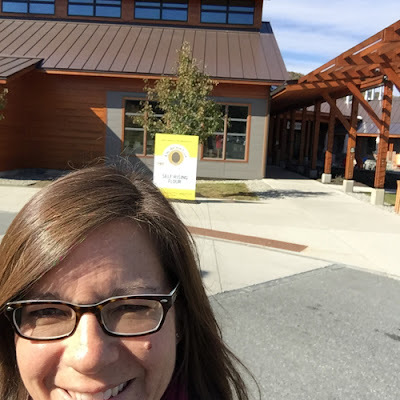 King Arthur Flour's Store/Bakery/Education Center! What a great day. So far my dream baking vacation courtesy of King Arthur Flour is everything I hoped it would be. I'm in a cool baking classroom at the home of one of my favorite companies, learning how to bake yeast bread even BETTER. Plus I'm in such a beautiful setting, getting to see things I'd never get to otherwise. 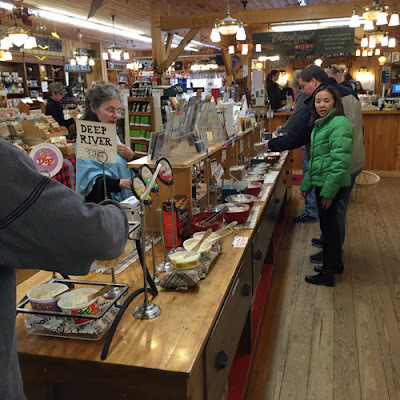 This morning I made a trip 20 minutes over the river to the Quechee Gorge and Quechee Gorge Village. I got to go on a beautiful (and somewhat chilly) nature walk to see the gorge, and then I went to the Cabot store where I tasted a bunch of cheeses and dips, and purchased a container of the best cheese spread ever: Extra Sharp Spreadable Cheddar. Oh my goodness. It's salty, sharp, cheesy, and ultra creamy. I have not even looked at the fat and sodium content because it won't matter. I will eat it all before my trip is over (thankful for the refrigerator in my hotel room). 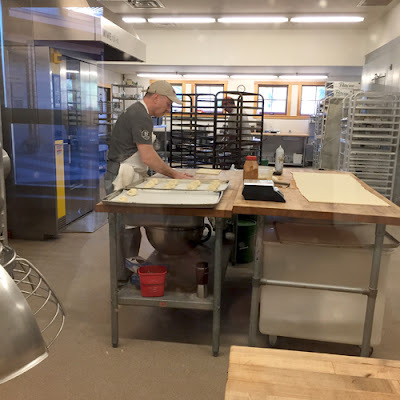 Then I had a walk through the King Arthur Flour store and met with Carey Underwood (not the singer) who got me started on my KAF adventure. 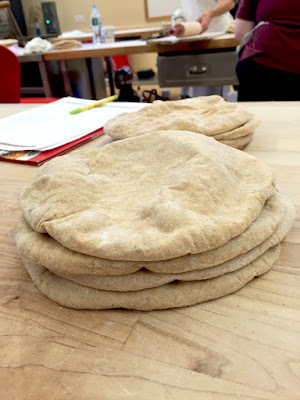 I learned a lot more about this wonderful company, and then it was time for my class where we made dinner rolls and a loaf of bread out of a basic bread dough AND we made wheat pita bread. 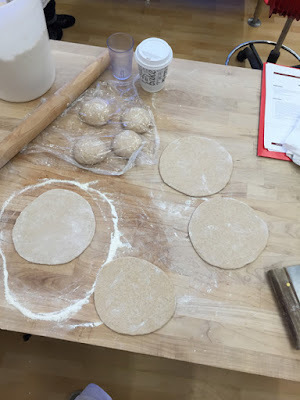 I learned a LOT about making yeast breads, like the water doesn't have to be warm to the touch, and the warmer the water and the room temperature, the faster the yeast will grow and make the dough rise. I guess I already knew that last one, but it's good to hear an expert say it out loud. I also learned that when I hand knead dough, I don't have to man-handle it, pushing it forcefully with the heal of my hand. 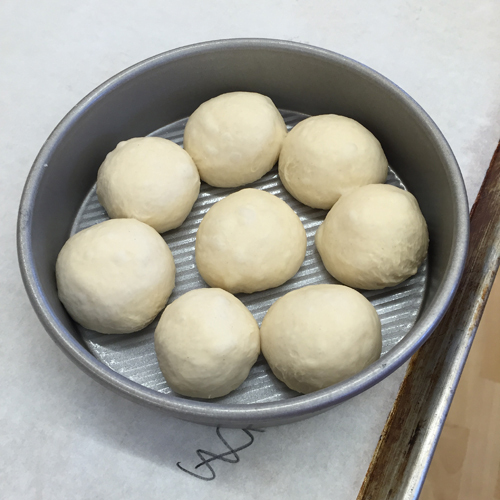 A gentler touch is what's best for a tender dough. Plus, I don't have to knead dough in a pile of flour, especially not an enriched dough. And I learned that you call a dough with fat an "enriched" dough and a dough with no fat "lean" dough. I mean, it makes sense, but I had never really thought about it all like that. I'm going to let my pictures and captions tell most of the story. 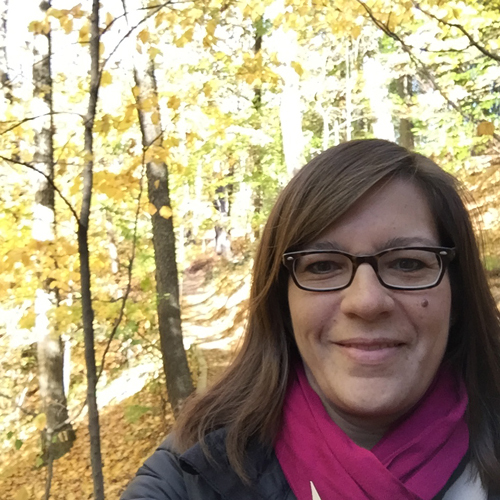 I think I bared enough of my mind and soul in yesterday's post. The tasting station at the Cabot store. A delicious lunch. 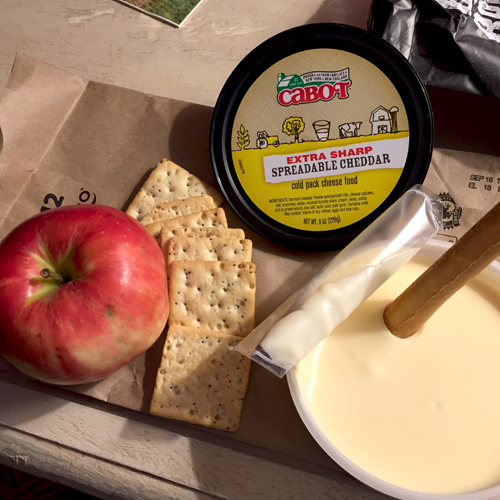 I had to use that bread stick as my cheese spreader. This guy was rolling croissants in the KAF bakery. 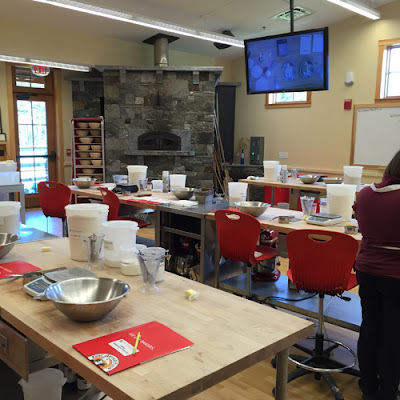 The baking classroom. That's a stone wood-burning oven in the corner there. We don't get to use it. Darn. 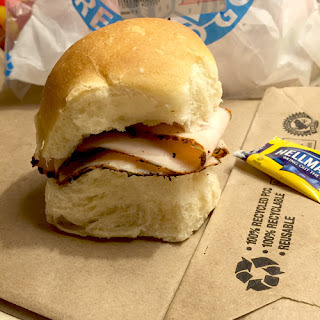 These were the best rolls. I'll be making them again for sure. 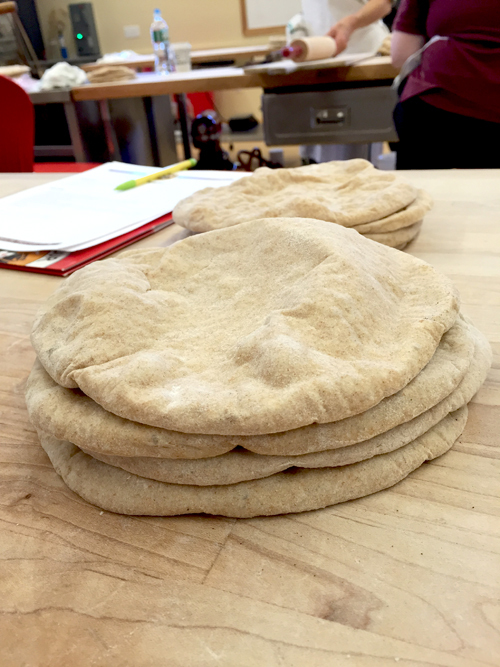 Pita bread is such a quick yeast bread. These are fun to make. 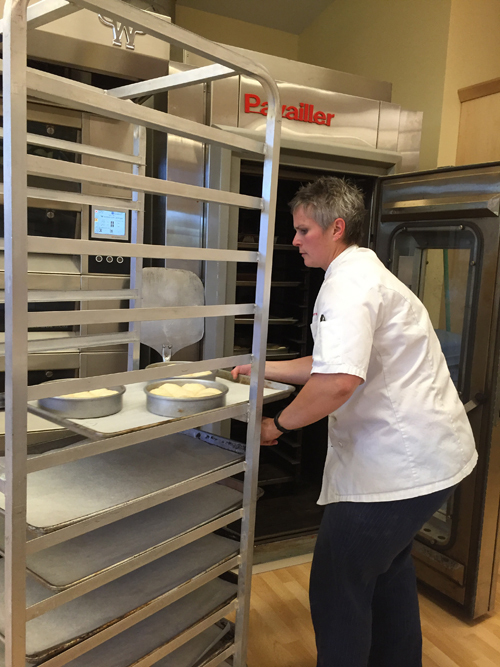 Teacher Jessica using the BIG oven. The staff took care of our dirty dishes too. I'm in heaven. 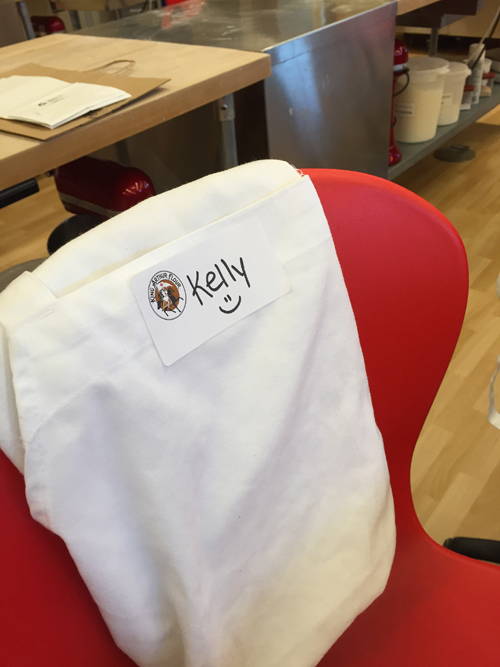 My apron ready for more action tomorrow. Dinner: a roll from class with Boar's Head Blackened Turkey. Om nom nom. Kelly! Yes Bakers special dry milk. I use it in some of my sour dough recipes and in my English Muffins.........so good! !